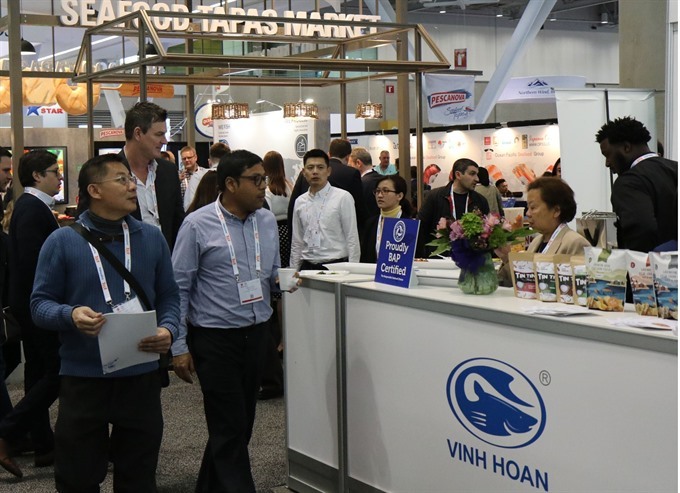 Viet Nam NewsHÀ NỘI — As many as 15 major Vietnamese seafood enterprises are attending the 2019 Seafood Expo North America, formerly known as the Boston Seafood Show, in the United States. Products displayed at the fair include frozen, fresh and processed seafood as well as modern processing equipment. The Vietnamese delegation, led by the Việt Nam Association of Seafood Exporters and Producers (VASEP), includes a number of companies that have operated in the international arena for many years such as Vĩnh Hoàn Corporation, Minh Phú Seafood Corporation, Hùng Vương Corporation and many other big brands such as Nghi Sơn Foods Group, Trang Thủy Seafood Co., Ltd and Seaprimexco Vietnam. According to VASEP’s vice general secretary Tô Thị Tường Lan, the quality of Việt Nam’s seafood is highly rated in international markets, especially the US market. “With the prosperity of the world’s economy in general and the US economy in particular, Việt Nam will have many opportunities to export not only two its main products (pangasius and shrimp) but also many other processed products with high added value,” Lan added. The Trade Promotion Centre of Cà Mau Province – a locality with many seafood export businesses – also attended the event and organised trade meetings with US partners. Cà Mau products currently account for 30 per cent of the country’s total seafood export volume. At the meetings, Nguyễn Tiến Hải, chairman of the Province, shared the locality’s efforts to develop a clean shrimp industry by improving processing technologies and promoting exports. Hải also said that besides increasing production to meet the needs of the market, the province has solved the problem of antibiotic chemicals in aquatic products, especially in shrimp, and strengthened the confidence of consumers in high demand markets such as the US. The expo will also include a number of seminars on economic trends and the development of the fisheries sector, growth predictions, consumer trends, a financial instruments for fisheries such as interest rates and monetary policies. Seafood Expo North America includes workshops for businesses to share information about product traceability standards and tge use of remote control devices in sustainable aquaculture to minimise impacts on the ocean and the environment. The event has drawn the participation of more 1,000 enterprises from at least 50 countries and will run until March 19. Việt Nam has become the fourth largest exporter of seafood in the world, with its products available in more than 170 countries and territories. The news was released by deputy director general of the Directorate of Fisheries under the Ministry of Agriculture and Rural Development Trần Đình Luân during a press briefing in Hà Nội. He said the sector was striving to raise its export value to US$10 billion this year, up more than 11 per cent year on year. To that end, it would continue restructuring production, carrying out the national action plan and a comprehensive plan on the development of the shrimp industry by 2025, he said. Total output topped 7.4 million tonnes last year, a 5.6-fold increase from 1995. Farming surpassed 3.89 million tonnes – a four-fold hike from 1995 – while exports hit a record of more than $9 billion.